California’s Robert Rosa (56) tries to stop Muir’s Andreece Brown (5) during the first half of Friday night’s CIF-Southern Section Southeast Division playoff game. Muir rolled, 44-17. It’s five up and four down for the area during the first-round of the CIF-Southern Section divisional football playoffs. Four of the five area winners were expected as favorites Monrovia, Muir, San Marino and Rio Hondo Prep all scored easy wins. The upset special of the night was Flintridge Prep beating Ribet Academy in overtime. And I’m a bit shocked that La Salle was knocked out, losing 12-10 at home to Centennial/Compton. Temple City, Arcadia, and St. Francis also lost. PASADENA – The myth about the Muir High football team is that the Mustangs have athletes who play football. But the reality is that Muir just happens to have football players who can also run fast. The Mustangs showed it again Friday night. 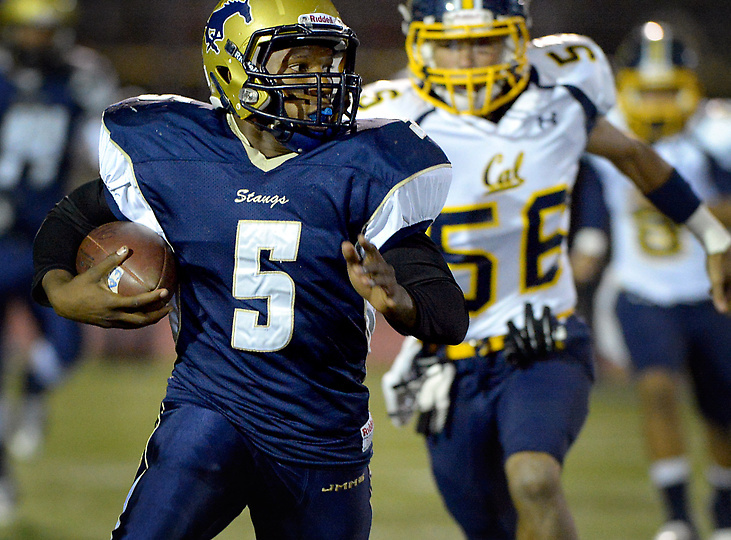 Andreece Brown rushed for 134 yards and three touchdowns and Joshua Muema-Washington accounted for 234 yards and two scores as Muir overwhelmed visiting California in the second half en route to a 44-17 victory over the Condors in a CIF-Southern Section Southeast Division first-round game. Muir, which held California to 92 yards in the second half, improved to 8-3 and will play two-time defending division champion West Covina in next week’s second round. California, which got 80 yards rushing from Aaron Garcia, finished 8-3, losing in the first round for the second consecutive season. La Mirada 42, Arcadia 17 — Adam Carrasco rushed for 229 yards and three touchdowns as the Southeast’s top seed rolled to an easy win. Arcadia, getting a 45-yard interception return for a TD from Nick Ryor, finished 4-7. Rio Hondo Prep 57, Bell-Jeff 6 — The Kares, getting 198 yards rushing from Nate Tayco and 149 and three scores from Colby Rivera, looked every bit like they are going to repeat in the Northeast Division. Flintridge Prep 34, Ribet 28, OT — Stephan Smith scored on a 2-yard run to force overtime and Clayton Weirrick conected Kareem Ismail for the game-winner in the extra period to win it. San Marino 42, Schurr 7 — Matt Wofford and Ryan Woods combined to rush for 115 yards in the opening quarter and the Titans rolled into the quarterfinals. Monrovia 50, Viewpoint 0 — Blake Heyworth threw for 149 yards and four touchdowns as the two-time defending Mid-Valley champs showed they are playoff ready. Centennial/Compton 12, La Salle 10 — Chris Rabine’s 37-yard field-goal with 9 seconds left was blocked as the Lancers’ dream season came crashing down. Lompoc 42, St. Francis 7 — Jared Lebowitz was limited to 137 yards passing as the Golden Knights season came to an end. Paraclete 49, Temple City 7 — The Rams changes proves to be no match for top-seeded Paraclete. All games are scheduled for 7:30 p.m. This entry was posted in Uncategorized by Steve Ramirez. Bookmark the permalink. Steve Ramirez has covered prep sports for San Gabriel Valley Newspapers since 1989. Good luck to all of our teams. You players and coaches have worked tirelessly since last winter and have provided a lot of enjoyment and pride to us fans. A special thanks to the Wildcats and Coach Maddox and his staff. Go make some memories. Nueva York!!! Wassup!!! We are hoping for a Complete game tonight. It seems like whenever you guys pick Flintridge Prep to lose, they end up winning. Tough night for Almont league all three teams fall with BG upset by arroyo …. Other than that no surprises all the top teams rolled …. SM vs San Dimas is going to be awesome next week! Kentera, does Lompoc still run the Wing-T? I don’t know, but I am sure glad Lompoc is out of the Playoff division with the RHL. Driving up to Lompoc, to get beat was even worse than driving to Paso Robles or Arroyo Grande to get beat. Napoleon Kaufman, remember him? The only game in his career he failed to run for over 100 yds was the CIF playoff game at eventual CIF champion SMHS in 1988. But he was a Freshman at the time. Otherwise it was a 2 1/2 hour bus ride to Lompoc, and an even longer ride home. Like I said, I am glad they are all in another division. Reaper, isn’t Paso much further? Why wouldn’t that be worse? Also you are right. There was a huge difference between Kaufman’s Freshman year versus his Junior year. Compare Coach Hobie to Bill Maloney. I’ve always felt Maloney was like a Bill Belichick of High School football. Actually, Maloney had a lot more fire than Belichick shows, but the strategies and methods to disrupt a high power offense were grounded in brilliant insight. Back to Lompoc. It’s amazing that a public school with 1400 students can be so tough. Do you think a big portion of the students are Air Force kids? Yeah more or less, pick you poison Paso Robles or Lompoc, it was pretty much the same long ride to get beat badly, and long road home. If you were looking for a sunny side, it was warmer in Lompoc and if you were a surfer you could go up early and hit Halama Beach… or go fishing. I am sure that many kids are airforce kids due to Vandenburg AFB, also ranch kids, plow boys, surfers, etc. Those farm and ranch kids are tough, Paso Robles and Arroyo Grande was the same. Re Maloney he was a Golden Gloves Boxer, thus his tough pugnacious attitude. Some of his earlier successes can be credited to prior coach Cunz who often would change his entire scheme and approach each year to match the strengths of this personnel. Cunz was early counsel to Maloney. Don’t forget stopping by Andersen’s Split Pea Soup in Buelton or the Dutch pastries in Solvang. Go to Mattei’s Tavern in Santa Ynez and drive past Neverland Ranch. Ughhh Ahhh, dont remind me of Santa Ynez reaper. It was too damn cold up there, and it was a disaster of a playoff game! dang la salle…losing to an at large team?? so much for all the hype. A. I know its football season, but something big happened in local basketball, when CIF placed PHS in Division 1AA. Sorry Coach Tucker, no championship banner this year. That’s an impossible division. B. Muir is on an 8-game win streak now, and has the highest Calpreps rating for the WSGV teams. Their #5 ranking in the Star-News poll is kind of crazy, and there is a strong argument for them to be ranked #`1 on this side of the 605. C. LaSalle’s loss to a 3-7 at-large team isn’t as perplexing as most believe it is. During the course of the season they were blowing out a long list of pretty-bad to average teams. They were never in a dogfight and never really played another team with similar or better athletes. Maybe next year, the AD won’t worry so much about padding the wins for his new hire and schedule some games that challenge the Lancers and prepare them better for the playoffs. The league they’re in is not their fault, so they’ll have to get rid of TC, Glendale, Westchester, etc. from their pre-season and replace them with better teams, just like Monrovia has done. They will lose a lot of talent with this year’s team, but with all of the talent in that town, and with the city’s residents’ penchant for going to private schools, LaSalle could be in a good position in the future, but they can’t schedule cream puffs like they did. But they were 1-19 the last two seasons, so I guess you can’t blame them too much for doing that this year. D. Just waiting for the Monrovia/Paraclete matchup in the Finals. The Northview victory that Sierra Canyon posted speaks volumes. E. St. Francis struggled mightily this season and will need better players in the future to get it done in the difficult Mission League. Good news is that their freshman team won league and looked very good this year. F. San Marino is an excellent team that most people slept on this year, due to the doubts of their schedule. They will prove how really good they are this week when they play SD. They have done all of this without arguably their best overall athlete Manuel Vargas who is an impressive talent. Not sure they’ll be this good next year because they lose a bunch of seniors, but Hobbie will always have them coached up. G. I would pay good money to see what Coach McFarland at TC could do at a place like Monrovia, WestCo, or Muir. I know he had a chance at PHS, but that place is tough nut to crack with no administrative or parental support. This dude can flat out coach. H. Arcadia played lights out in the first half vs. La Mirada, and it’s kind of the untold story of the weekend. They played their best half of the year and didn’t have the horses to compete for 4 quarters, but that’s been their story all year long. They need so more talent there and will have to recruit because they will only get good classes like last year’s every few years or so. I. RHP will meet Mission Prep in the Finals. J. Harrison is doing a bang-up job over at Flintridge Prep. Last year they had to fold the team and one year later they’re in the quarterfinals! Pretty impressive. That was an awesome write-up. I totally agree about Muir’s legitimate argument for area #1 team. I take Monrovia, and I know I am bias toward Monrovia. Muir’s game against West Covina is their first game against a quality Southeast opponent. I don’t have much respect for the Del Rio League in general and the rest of the Pacific just got wiped out. Muir’s losses came against juggernauts. So how is someone suppose to grade them? Monrovia beat Saint Francis in a weak display of football, we whipped up on San Dimas, and beat San Marino. Regarding Coach McFarland: I’ll take your word for it, but you did not offer any support for that statement. Also getting worked over so badly by San Marino is not a good showing. Temple City’s biggest victory was against South Pas in order to get into the playoffs. I am not suggesting anything one way or the other, but unfortunately the body of work is clearly a work in progress at TC. You are spot on about La Salle. If La Salle made a real commitment, they could eclipse St. Francis. They have the ability to become a real powerhouse if they offer scholarships. I suppose lack of on campus stadium (big stadium) might hold them back. Is there any other private school that is actually in Pasadena? No. They definitely need to beef up their schedule, though. San Marino’s success will likely be cyclical. They will probably compete for a playoff spot every year due to coaching and effort, especially if Monrovia ever got moved out of the league, and they will have great year’s like this one on a cyclical basis depending on talent. Yeah, the Monrovia/Muir argument is tough one. Monrovia has the best win, vs. San Marino. Muir’s best win is Burbank. Burbank is just as good as the Titans, but I’d give San Marino the nod because of their record and their coaching. Muir played the more difficult schedule, and probably had it’s best showing between the two when they were only down 13-6 at the end of the 3rd quarter vs. Upland. It is difficult to gauge Muir based on their losses to powerhouses and their win streak against the Pacific League and Cal, and you’re right, we’ll know a lot more about them after this Friday. If they beat West Covina, I think Muir deserves the nod over Monrovia, but even if they don’t the idea that they are the #5 team in the WSGV is off base. After going 1-19, I can understand why La Salle would schedule cupcakes the way they did. Now that they’ve proven they can play good ball, they need to schedule up. 10-0 is a mighty big bag to have all the air let out after the first round. I’m sure there are many around the program that are scratching their heads, but the Lancers didn’t play one program that played anything like Compton Centennial. As a matter of fact, Centennial isn’t even that good of a team, but they have athletes that can turn it on when motivated. The fact that La Salle didn’t even score an offensive touchdown is revealing. They just weren’t used to playing vs. that type of talent this year. And they aren’t the only private in Pasadena, with Poly and Maranatha in the mix. But they can make noise if they so choose, as could Maranatha. You’re right about San Marino. There isn’t talent in that city to have a 9-1 season on a regular basis, but Hobbie will keep them relevant in the league and division for quite awhile. As far as McFarland, the guy knows the game in and out. The totality of his work at TC hasn’t proven that, that’s for certain. There has been a tremendous drop-off in talent at TC and some of the school’s best athletes don’t always come out to the gridiron, like some of last year’s baseball studs. San Marino has a much better team this year than TC does and that score was expected in my opinion. McFarland is the right guy, he just was dealt a tough hand after the mess at TC a few years ago. However, if that Arcadia job ever opens up, and comes with a teaching job, the Apaches would be smart to make a move and go after Coach Mac. I agree, if Muir beats west covina. Which Lord knows I hope they really do, Im tired of seeing Muir get knocked out in the 1st and 2nd rounds, In my opinion they are too good of a team and with too much talent not to go deep in the playoffs. But time will tell if its the same old muir, or west covina is really still the team to beat in the division, or if Muir is FOR REALS NOW!! This whole post is about the past. Yes, Cats did go on to win it all, cool. Hoping Saints meet up with Mtown at the Ship! That’s true. This also raises the point that this will be the first year that the winner of the regular season match-up between Monrovia and San Dimas will go on to win the CIF Title. In past years the loser of the match-up did…Obviously things have changed. haha. Hey Genius , we both gotta get there first! True but your road is more challenging. If You win, you go to the frozen tundra to play the clete. Yah, true, not thinking that far, SMs gonna bring it! Lancaster could get in the 30s this time of year. Smart Man. Indeed they will be bringing their A game friday night. And yes lancaster gets Cold as Ice! Not true at all. Re-read what I wrote. Only Monrovia needs to get there to accomplish what I wrote. Total respect for the Titans! Z too! I have a lot of respect for the Stangs, but they don’t beat Mtown. The line core is a great observation. Monrovia has the best demographics for putting together a balanced football team among any community in the the entire SGV. Our team reminds me of a mini version of USC, but our performance lately has mirrored USC’s as well. The next thing we need to do is get into a tougher league and find a way to create a sense of urgency and toughness from the very beginning of the off-season. The only way for us to hit our potential is to continually play tough competition from Week #1 through week #10 plus post-season. New York…you are spot on…Scheduling is Monrovia’s issue…if they are in a tougher league, and have a tougher preseason…then Monrovia could battle with the Amat’s and Charter Oaks of the Valley. I think they could now, but would probably come up short because of the very reason you just stated. Don’t be envious that the Saints have maxed out their potential and Monrovia still has plenty of room to grow. I would think so, hello! Monrovia probably has twice the students San Dimas has! Guess your saying Monrovia has not been able to achieve potential growth for whatever reasons (discipline ). Good luck there. My bad, that’s still 400+. They should have the edge on SD. Correct. We do have the edge. It’s time for Monrovia to stop playing “baby ball” against teams like San Dimas. Well see what discipling saints have against SM this friday! That’s exactly what I am saying. We still have lots of upside. Stay out of the way. I disagree on the discipline issue. I think we need to play with more wreckless-abandon and killer instinct. Actually we do lack a lot of discipline on offense regarding delay of game and snap count issues.